Did y’all expect I would share a sweet treat for St Patrick’s Day? Aaah, you were right. 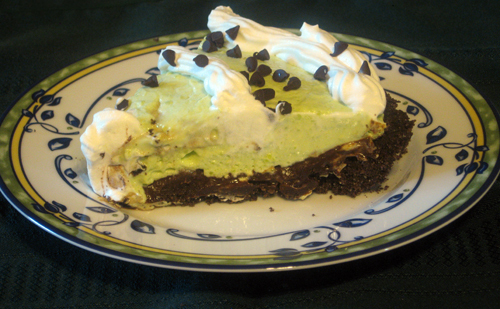 This Lucky Mint Pie recipe comes from Very Best Baking.com. 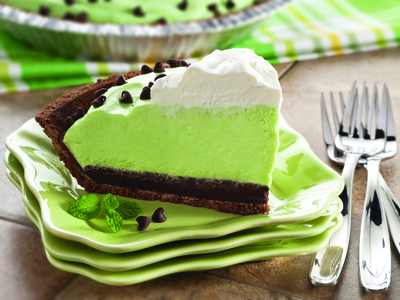 The minute I laid eyes on this refreshing mint and chocolate pie, my mind was set on serving it. A layer of rich chocolate ganache topped with a creamy mint layer, my family will be impressed. Of course, I did make a few minor changes. To reduce calories and some fat I used light whipped topping and margarine instead of butter. In addition, the chocolate graham cracker crust was home made. Below is my standard recipe. Since I had chocolate grahams in the pantry, the cocoa was omitted. You’ll hear more about that later on. Whirl crackers in a processor or place in zip lock bag and pound until crushed. Combine the crumbs, sugar, and baking cocoa in the pie dish; stir to mix. Add melted butter and mix well. Press into the bottom and up the sides of the pie plate. Bake at 350 for 5-10 minutes or chill to set before filling. MICROWAVE 1 cup morsels and 1/3 cup evaporated milk in medium, uncovered, microwave-safe bowl on HIGH (100%) power for 45 seconds; stir until smooth. Stir in butter; pour into crust. Refrigerate for 20 minutes or until cool to the touch. MEANWHILE, BEAT remaining evaporated milk, pudding mix, water, peppermint extract, and 3 drops food coloring in medium bowl until combined. Gently stir in 2 cups whipped topping and additional drop of food coloring, if desired. Spoon over chocolate layer. REFRIGERATE for 2 hours or until set. Sprinkle with additional morsels. Spoon remaining whipped topping in center of pie. Garnish with fresh mint. The crust was just ok. Omitting the cocoa and using chocolate grahams was a bit disappointing. Cocoa adds deep, rich chocolaty goodness whereas the chocolate graham crackers were simply chocolate flavored. No one noticed this except for me but my opinion does count, I think. Anyway, the rich dark chocolate ganache made up for the lack of depth in the crust. The filling was very minty, light, and quite refreshing. 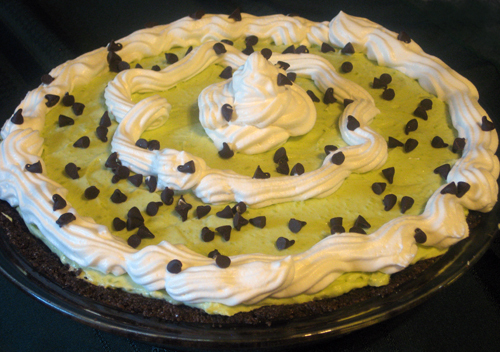 My father loved it and even boasted to my brother saying how scrumptious the St Patty’s Day Pie was.